Image courtesy Welcoming Stories: "Mona"
How can professionally produced digital storytelling and user-generated content change the way a project gets traction “beyond the choir”? Welcoming Stories sought to understand how professionally produced digital storytelling, paired with a call for user-generated content, could change the way a project gets traction “beyond the choir.” This project grew out of the AV Lab’s work on Shelbyville Multimedia. Watch all of the Welcoming Stories. So many immigrants’ stories include memories of people who helped them upon first arriving in America. For those who are trying to stimulate conversations across generations, nationalities, and other divides, this is a powerful message. 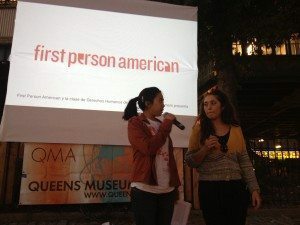 In 2011, AV Lab commissioned Irina Lee, director and creative force behind First Person American, to create a pilot for Welcoming Stories — five beautifully crafted first-person memoirs of immigrants who wanted to acknowledge helping hands from years gone by. Nika (above), now a magazine editor, describes unwittingly talking back to a teacher when she first arrived in elementary school. Midway through a cheerful anecdote about her Indian parents’ cultural mishaps, Mona’s voice cracks and her eyes fill (below). We showed these 4- to 5-minute videos to immigration experts, educators, and museum curators — the enthusiasm was infectious. Due to the nature of the short and sharable videos, we envisioned the content in taxicabs and on giant screens, featuring movie stars and athletes. With social media as our vehicle, First Person American and AV Lab targeted our audience and solicited user-generated content. However, we quickly learned that the conventional launch opportunities such as a theatrical release or film festival screening can establish content in a way that’s still challenging for online-only stories. That’s where relationships came in. Irina and her team worked with Facing History and Ourselves — a long term Active Voice partner — to create a high school Welcoming Stories hands-on workshop. 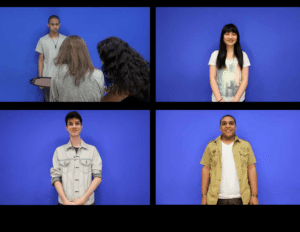 Using the five pilot stories as prompts, students learned to integrate storytelling, journalism, activism, and video production to gain a deeper understanding of immigrant integration. Hailing from Bangladesh to Brazil, and China to Columbia, the kids scripted, rehearsed, crafted, and confidently presented their own narratives to an audience of parents and supporters in Queens, NY. "Collaborating with Ellen and the Active Voice Lab was a fantastic experience for us at First Person American. I'm proud that Welcoming Stories is now a workshop, a book, a community outreach initiative, and has been screened by multiple cultural and government institutions."